What Day Of The Week Is November 17? 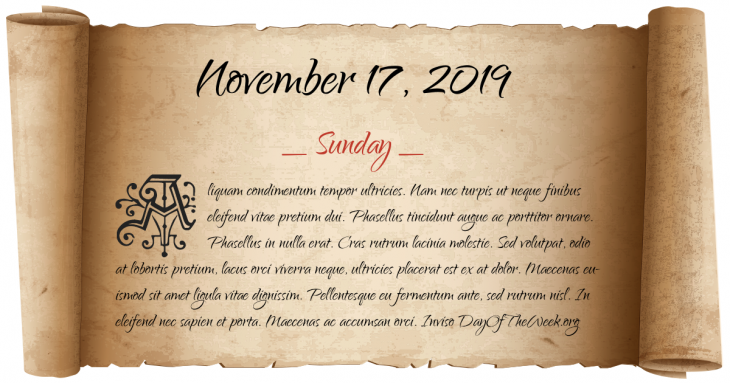 November 17, 2019 is the 321st day of the year 2019 in the Gregorian calendar. There are 44 days remaining until the end of the year. The day of the week is Sunday. Articles of Confederation are submitted to the states for ratification. Napoleonic Wars: Battle of Krasnoi. The Russian Social Democratic Labor Party splits into two groups; the Bolsheviks (Russian for “majority”) and Mensheviks (Russian for “minority”). American scientists John Bardeen and Walter Brattain observe the basic principles of the transistor, a key element for the electronics revolution of the 20th Century. Who were born on November 17?